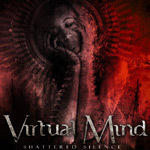 Review: "Virtual Mind: Shattered Silence" - Sea of Tranquility - The Web Destination for Progressive Music! Virtual Mind is an Italian progressive metal act, whose central figure is the guitarist Fransesco Fareri. The purpose of the band was to add something new to the genre of progressive metal, and, well, mission accomplished I'd say. There are elements of standard progressive metal on this album, such as a high level of technicality, challenging rhythmic patterns, unconventional song structures and long songs. However, making use of 7- and 8-string guitars, Virtual Mind's takes standard progressive metal in a much heavier and darker direction. With no keyboards, Virtual Mind also places the focus completely on the guitar riffage, which is both crushingly heavy, groovy, melodic, aggressive as elements from groove metal, thrash metal, power metal, traditional metal, melodic rock and so on are infused into the music. Fareri is obviously an extremely talented guitarist who masters both the rhythm and solo aspects of guitar playing (there are lots of technically impressive shreddy solos on this album). The level of musicianship certainly is very high in this release. While there is nothing as such wrong with the musicianship, the compositions and the performance, this release unfortunately suffers productionwise. Firstly, the mix is very unbalanced with the guitar being totally dominant. Given that this is guitar-driven progressive groove metal, the idea of dominant guitars may sound like it makes sense. And perhaps it does, theoretically, but in practice the consequence is that the overall sound comes across as being unintegrated and unbalanced, and actually, the music loses a lot of its punch. Another problem is the fuzzy guitar sound. Now, in some contexts, a fuzzy guitar distortion is great, but given that this is based on heavy and groovy riffage, a sharper and more defined type of distortion would have been much better, since it adds an adge to the sound that really allows for the breaks and pick strokes and other details to stand out, which normaly makes heavy and groovy riffage sound even more crushing � there should probably have been more treble on the guitars. The drums also sound kind of flat, and the bass, while audible, could be more defined and placed more in the foreground. In terms of production, this release has more of a demo quality to it and I think that it should have been processed by a professional producer before its release. It is really a shame about the production, because it disturbs the listening experience a lot and does not do any favors to the music itself. There is so much talent in Virtual Mind, and so much potential, and the tunes themselves are very good, I think, but the DIY quality of the production really prevents the talent and awesomeness of the music from shining through. Bad Production aside, Virtual Mind show that they are capable of writing original, heavy and groovy riff-based progressive metal, and that there is a lot of talent and potential in this project, which hopefully will come to full fruition on their next release. It should be reiterated that the music itself is quite good on this release, and, if you like heavy and groovy metal with progressive twists and turns, then by all means check out this Shattered Silence. This is awesome progressive metal trapped in a prison of bad production. Here's one heavy progressive metal release that has one major thing going for it, the supreme guitar work of Fransesco Fareri. This guy delivers some bone-crunching Pantera-meets-Symphony X styled riffs throughout Shattered Silence, and he can also shred with the best of them. Pinch harmonics and massive riff-o-rama fly about the mix here, but unfortunately that where most of the positives end. The vocals are grating and bordering on annoying, making you want to hit the fast forward button so you can hear more riff sections or solos. To make matters worse, the overall mix is muddy with guitar being way too overpowering. It's a shame as you can tell the drum & bass work is more than competent, but it's unfortunately buried. The songs themselves are not bad, quite heavy actually for the prog-metal genre, but for many the bad vocals and production are going to be tough to overcome. My suggestion to Virtual Mind-find yourself a new vocalist who has the style and range to handle this type of material, and find a better producer. There's certainly some talent here.